Durga Mandir at Jichho at Bhagalpur is of not great antiquity but is famous because the murti of Goddess Durga worshipped is highly powerful and is also a wish fulfilling deity. The temple is located at Jichho in Bhagalpur, Bihar. It is believed that the presence of Goddess Durga at Jichho help in overcome a huge storm that hit the region. The most important festival observed here is the Durga Puja. It is spread over ten days. Special jagran rituals are observed during the period. Tuesday and Friday attract maximum crowd to the temple. It is believed that prayers offered at the feet of Goddess will be answered. 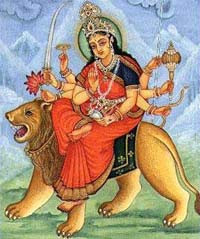 She is thus considered as a deity who is kshipraprasadini - one who blesses immediately. People arrive in the shrine to find to relief from serious illness. She fulfills the desires of devotees like new job and early marriage. She is also propitiated for defeating enemies. Animal sacrifices were held here before but now people make other offerings like red cloth and coconut.